A special customer wanted a special gift. A notebook for each country where he and his girlfriend intended to travel. Our team personalized each book with a country or city, as requested and a travel log for additional travel notes together. Pocket sized leather notebooks are a wonderful way to keep a written record of your adventures abroad. Keep on your bookshelf, desk drawer, bedside, or siply a keepsake for years to come. It's wonderful to see how creative our customers can be. We are always here to help with the creative process as well! It is said that the bow tie originated during the 17th century during the Prussian war where Croatian mercenaries used a scarf to hold their shirt together around their neck. This style was then adopted by the French, that they called 'Cravats' (from the word Croat), by the French Upper Class. The fashion then flourished during the 18th and 19th centuries. There is a historical gap between whether the cravat evolved into the bow tie, or into the neck tie and then in turn the bow tie. 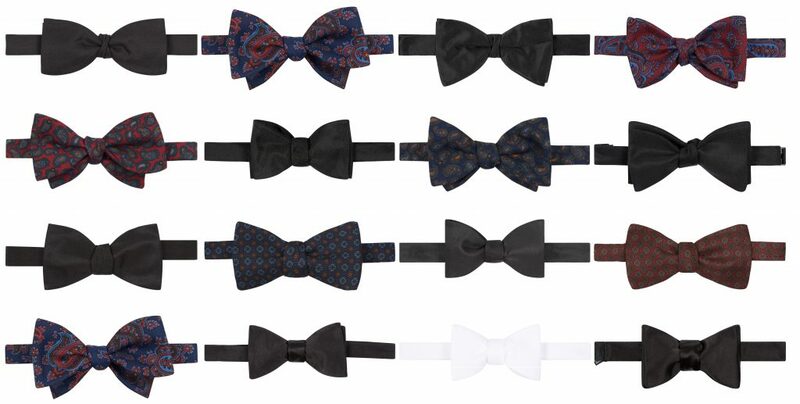 However, the traditional bow tie is sized and of a fixed length although adjustable and ready made styles are also widely available but less formal. 1. When wearing a wing collar, if you want to look smarter than the average Joe, go for a batwing collar. This style that originated in the 1930s will give you that extra touch of class. 2. When dressing for White Tie, where a detachable wing collar is required, it is advised that you wear a sized, self tie bow tie for a more polished look as you cannot see the clip if you were to wear a ready made or adjustable bow tie. 3. Always tie your bow tie yourself, a self tied bow tie looks so much smarter than a ready made, and if you can't it's a skill that all well dressed gentlemen should have. Check out our 'How to tie a bow tie' video below if you need a helping hand. 4. And finally, have fun with them! Bow ties are a great way to add colour and flair to any day to day outfit. 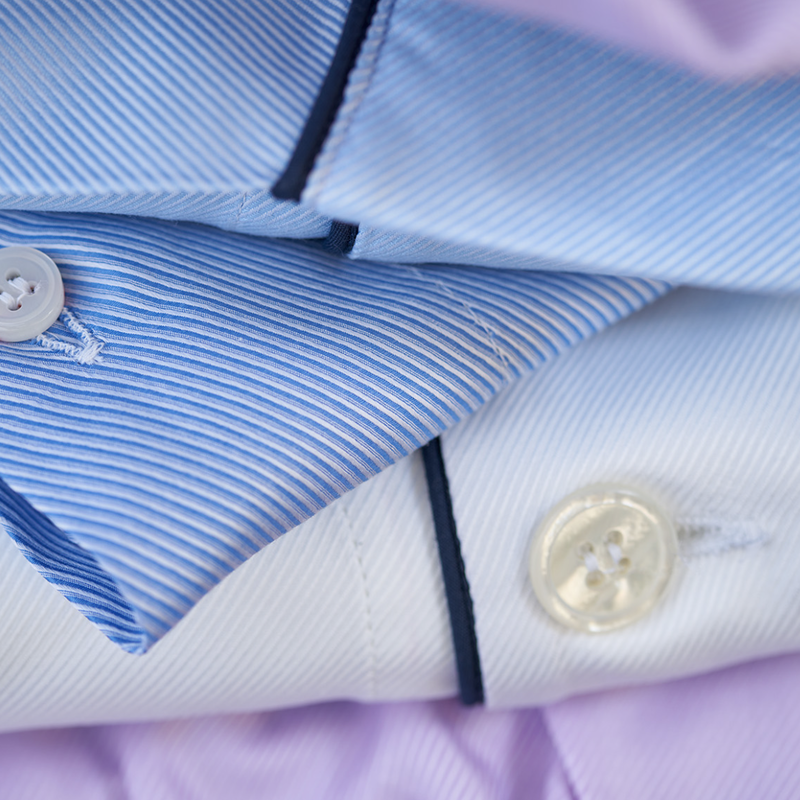 Sterling & Burke is making a name for itself as the premier destination for custom and bespoke shirts in Washington DC. Men's dress shirts continue to be the focus, however, new options are now available including more casual linen and chambray in addition to women's bespoke! We are thrilled to offer women this service as well. This coming Friday and Saturday, June 1& 2 we again welcome Darren Tiernan and James Macauslan from Budd Shirtmakers, taking Bespoke appointments in their permanent showroom space at Sterling & Burke in Georgetown, Washington, DC. Please reach out to us directly to schedule an appointment or stop in to preview the offering and shop the entire accessory collection. We are not shy to declare we specialize in business accessories and gifting. One lifetime milestone where this specialty particularly resonates is graduation time. In Georgetown, we enjoy being adjacent to two incredible universities - Georgetown University and George Washington University. These Universities have sophisticated undergraduates and graduate students alike. Keepsake items such as fountain pens, original art of DC and Georgetown, University desk boxes, and logo items such as needlepoint belts and wallets are very special indeed. If you are looking for something more practical as the student enters the work force or goes on to the next adventure, we have you covered as well with briefcases, portfolios, wallets, travel bags, leather notebooks and more. Don't forget, almost any item we carry can be personalized, feel free to get creative! Most of our customers are not aware that we have a treasure trove of vintage flags. These very special pieces are for enthusiasts and true collectors alike. Rare antique flags, handkerchiefs, pillow cases and more. They are waiting to be framed for your home or office! With our store in Washington, DC, many of our customers like to hang flags in their office, especially when they work in a government building. These items are perfect! They also make a wonderful gift, ranging in size from a few inches square to many feet wide for those extra spectacular spaces. Let us know if you want to come look through our chest of flags and pick one for your empty wall. 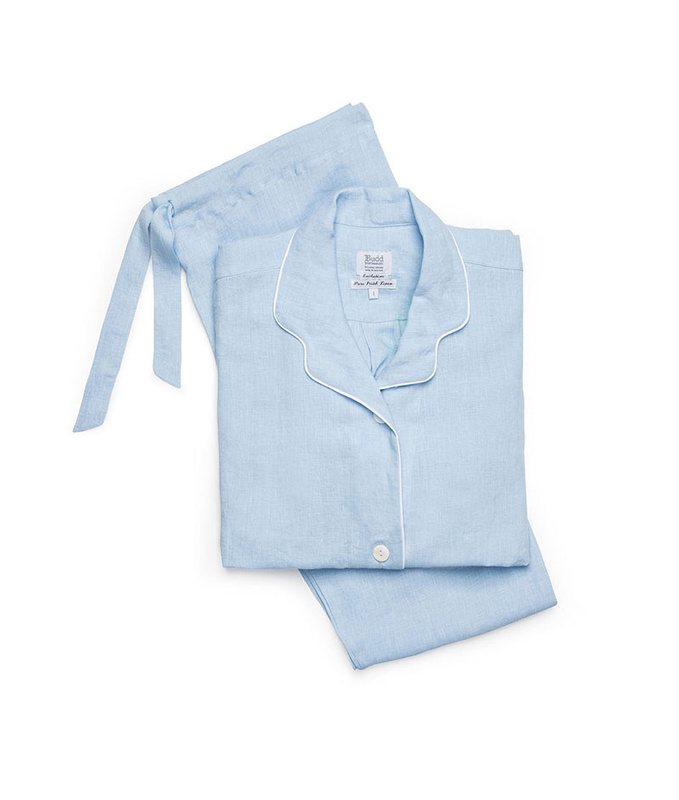 Today is National Pajama Day and given the resurgence of the pajama as clothing for day and night, home and play, we thought this celebration was a great way to honor this Budd staple. 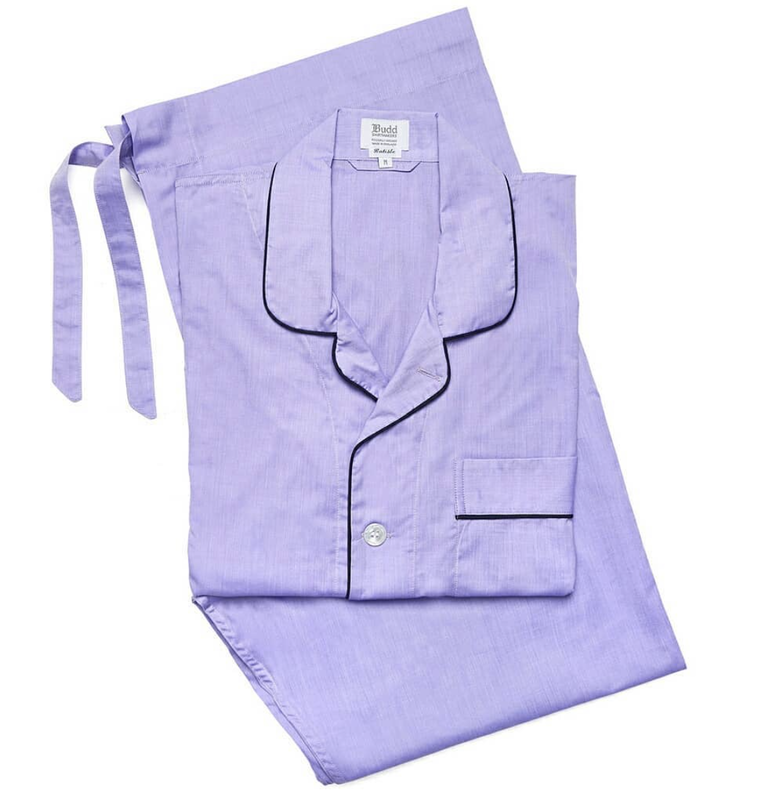 Pyjamas, pajamas, jim jams or jammies, call them what you will, everybody has a favorite pair of pjs languishing in their drawer. Indeed, who amongst us, doesn’t dream of heading home at least once a week to languish in them? A product synonymous with Budd, this luxury had only ever been available for the men. Now, with the launch of a women's line in 2017, everyone can enjoy the pure elegance of Budd pajamas. 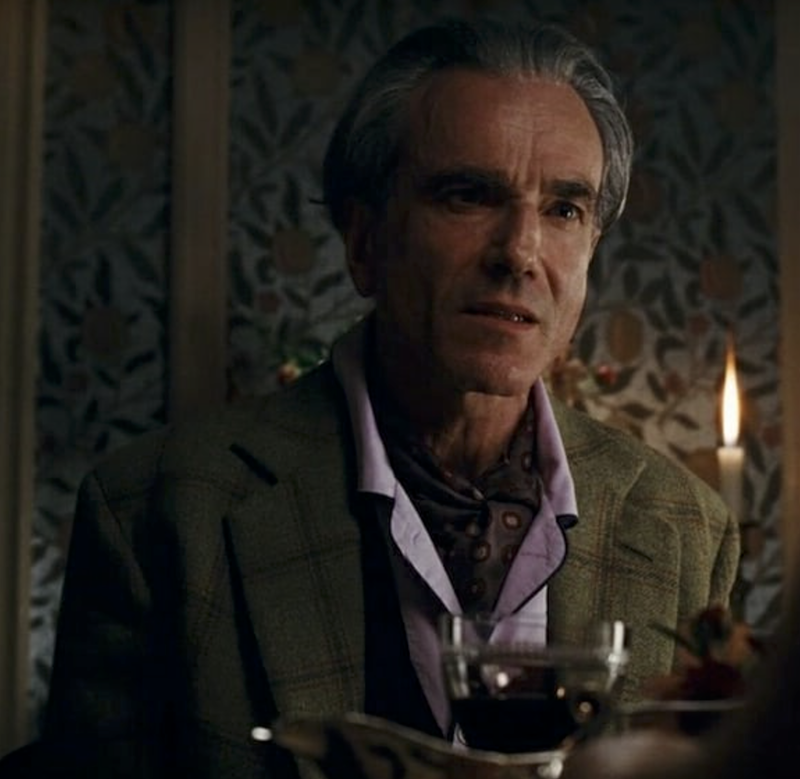 Daniel Day Lewis showed just how great the Budd pajamas looked in Phantom Thread, donning them so stylishly for much of the movie, even when in the clutches of a few killer mushrooms. Much has been said about the actor’s sartorial know-how and splendor throughout the film and his first hand involvement in choosing his wardrobe showed a great, aesthetic eye. Mr Woodcock even gave his pj’s a daytime makeover, twinning them with his Anderson & Sheppard overcoat, for a louche look that really worked. 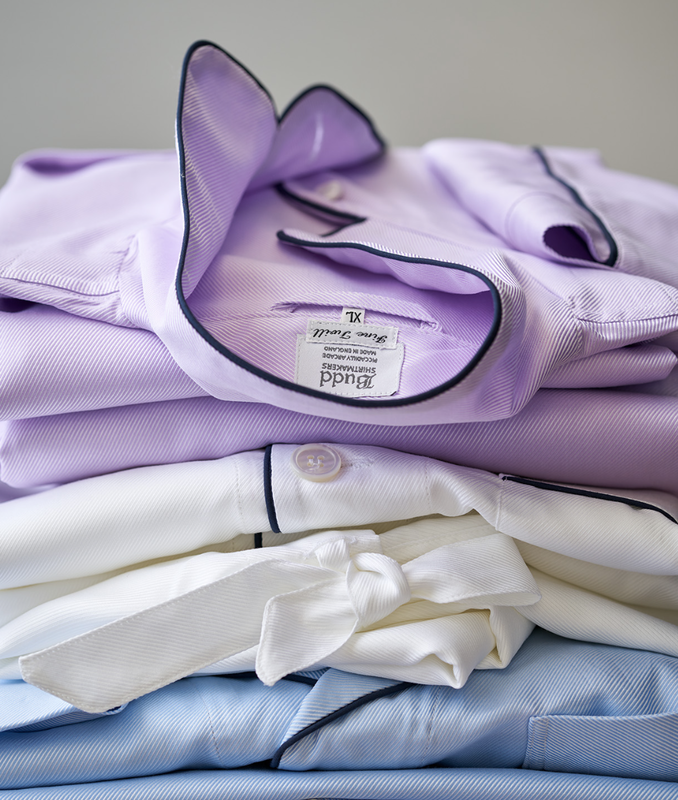 Budd offers a multitude of qualities and colors, from simple poplins and luxurious silks, through to cotton cashmeres for when the nights draw in. The minute things warm up or our cases are packed for hotter climes, we love the linen look and the lightness of the Batistes. As we do three times per year, we welcome our friends from Budd Shirtmakers to our store to take Bespoke shirting appointments. This visit is extra special as they take up residence for the weekend in their permanent space within Sterling & Burke. The entire lower level is dedicated to Budd Shirtmakers, all year round. The most recent addition to the collection is custom shirts. We have a range of sizes and fits for you to try and then adjustments are made based on your body and style. You have the option of collar and cuff styles as well, truly making this shirt your own. The fabric choices seem almost endless, with only the finest fabrics available. The most amazing part of the service is that they produce each shirt in the same manner a fully bespoke shirt would be produced - hand cut and stitched in England. They are also happy to take appointments from female customers. Bespoke shirting is not widely available to women, and we are excited that we are one of the first to promote this service! The complimentary accessories are equally as impressive, with every item a gentleman would need in his wardrobe. 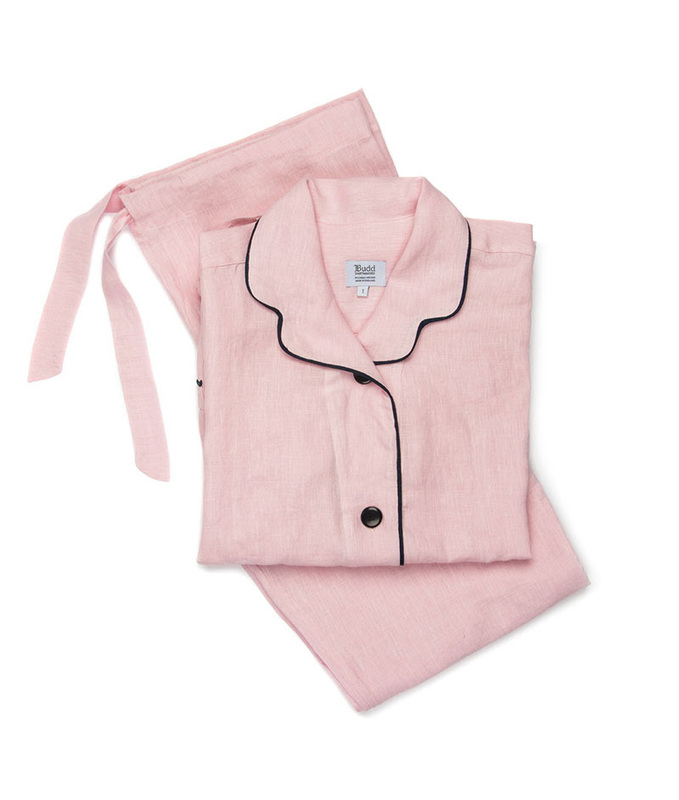 From ascots and silk scarves, cufflinks, studs and ties to silk robes and fine cotton pajamas. Come meet these fine Gentlemen, Thursday through Saturday mid-day. Please ring if you wish to set an appointment for Bespoke or Custom Shirts. A client came in looking for a simple yet tasteful christening gift for his friend's baby boy. We have a beautiful and timeless selection in our store for this very special occasion. He picked out a pewter frame with the baby's name and birthdate engraved. Included was a gorgeous card with precious blue baby footprints. One of our favorites from Dempsey & Carroll who produce some of the most exceptional engraved stationery available. One of our other favorites for a special occasion or even just for a mother to be or new mom is a Baby Notes book. Track all of the special, and maybe not so special but significant milestones in every baby's life and your new life as a family. The history of the bow tie, types of bow ties and a video lesson on how to tie your own bow tie. From Budd Shirtmakers in London.